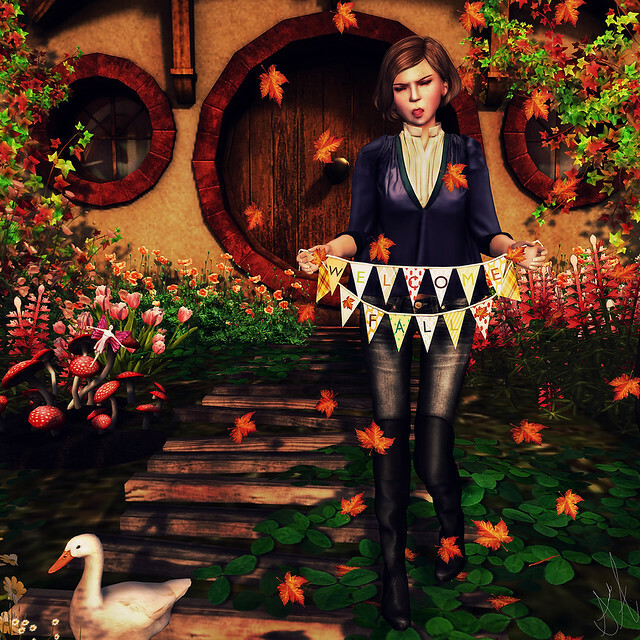 Ramblings of an SL Shopaholic: Welcoming Fall- Preview of a Couple Season Story Things! Welcoming Fall- Preview of a Couple Season Story Things! So I know a lot of people are getting a little event-ed out, meaning there are so many events in SL that it's almost like it's pointless to go to the main store, just because designers get into so many events that they forget to do releases for their store. I feel you, I feel like that a lot of the times, however, I do still love a good event because it lets me see the creativity of designers, along with discovering new places and stores that other wise I probably wouldn't have known about. So, that brings me to this new event named Seasons Story. It's amazing cute, and I just adore it, it's got a lot of the bigger Japanese/Asian brands, but still has some main stream stores like Floor Plan and Wasabi Pills in it! I just love everything about this, the set up, the idea, the items, the quality, and the feel to this event, so... well done, it's a home run in my opinion. I decided to do two different looks just because there's so much I want to show you guys, and I wanted to start today, I originally wanted to do more looks for this post, but I'm going to have to divide it, too many amazing things to go through. I have to say that also the pose makers did a fabulous job this event, it gave me so much inspiration for pictures, so.. to everyone in this event, thank you, you've given me so much to work with that I'm actually overwhelmed by inspiration! Now on to the looks and the slurl so you can go and check out this amazing new event because.. trust me,you really don't want to miss out on all this fabulousness!